Region: Many species of this beetle can be found throughout North America. Life cycle: One generation every three years. 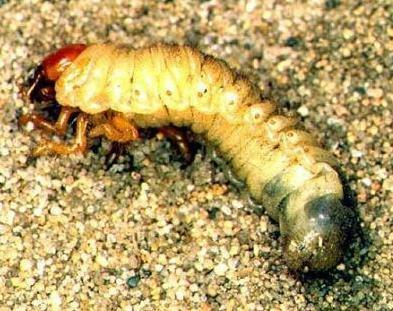 The grubs overwinter in the soil for the first two years, and then the third winter is spent in the pupal stage. 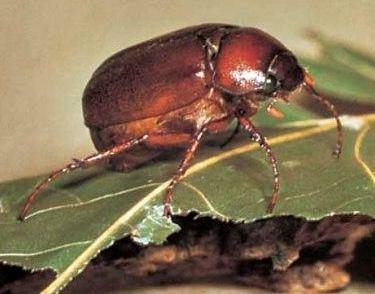 Physical Description: This 1 inch, hard-shelled beetle is black or reddish brown. The eggs are laid separately several inches (1-8) below the surface of the soil. The plump larva is gray/white with a brown head. Feeding characteristics: As grubs, they feed on underground plant parts during the summer, such as, roots of bluegrass, timothy grass, corn, soybeans, and several other crops. Controls: Use Milky Spore Disease to control the grubs. The Digger Wasp is a natural predator, that will dig down after the grub.